User searches and user journeys are two ways you can locate information about your users. User search allows you to display a list of users based on search criteria; user journey is the full history of an individual user. All user activity is stored forever, meaning you can search on actions your users performed at any point in time. User Search enables the same filters that are available for building campaigns, allowing you to quickly discover and view user segments. You can click the pencil icon next to a specific search to rename it. Additionally, you can delete old searches by clicking the trashcan icon. 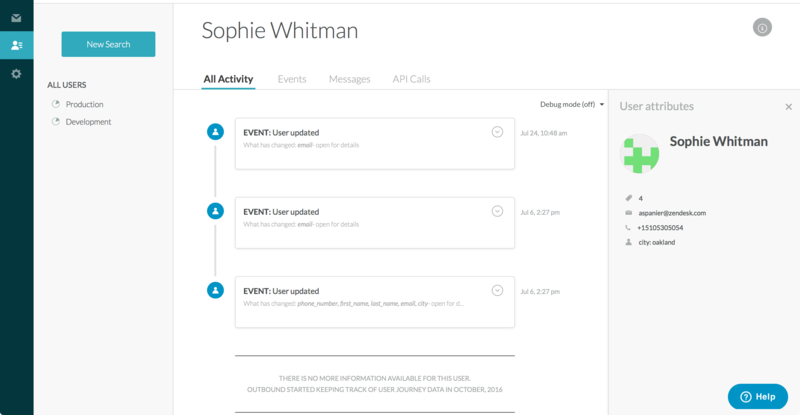 Every event and user update we receive through the API (including the body of the API call). Every message Connect has sent to that user, including the rendered content (with variables) that the user received. If you want even more detail, you can turn on debug mode, which shows every message we attempted to send and why the message was not sent (i.e. the specific filter that failed to pass, rendering error, timeout, etc. Note: For Privacy API users - The first release of user search & journey is not available for Privacy API users.